This list of volcanoes in Iceland includes 31 active and extinct volcanic mountains, of which 18 have erupted since human settlement of Iceland began circa 900 CE. 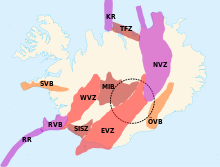 Iceland has four volcanic zones: Reykjanes (Reykjanes Ridge, the Mid-Atlantic Ridge South of Iceland), West and North Volcanic Zones (RVZ, WVZ, NVZ) and the East Volcanic Zone (EVZ), (Westman Islands). The Mid-Iceland Belt (MIB) connects them across central Iceland. There are two intraplate belts too (Öræfajökull (ÖVB) and Snæfellsnes (SVB)). North of Iceland the Mid-Atlantic Ridge is called Kolbeinsey Ridge. The central volcanoes (Iceland's East Volcanic Zone (EVZ)), Vonarskarð and Hágöngur belong to the same volcanic system, this also applies to Bárðarbunga and Hamarinn, and Grímsvötn and Þórðarhyrna. It is proposed that the line Grímsvötn volcano, Mid-Iceland Belt (MIB) to Snæfellsnes volcanic belt shows the movement of the North American Plate over the Iceland hotspot. ^ "Global Volcanism Program | Kolbeinsey Ridge". ^ Jóhannesson, H.; Sæmundsson, K. (1998). Geologic Map of Iceland, 1:500,000. Bedrock Geology. Icelandic Institute of Natural History and Iceland Geodetic Survey, Reykjavík. ^ a b Gudmundsson, Magnús T.; Thórdís Högnadóttir (January 2007). "Volcanic systems and calderas in the Vatnajökull region, central Iceland: Constraints on crustal structure from gravity data". Journal of Geodynamics. 43 (1): 153–169. Bibcode:2007JGeo...43..153G. doi:10.1016/j.jog.2006.09.015. This page was last edited on 19 March 2019, at 15:35 (UTC).